From Goodreads: Teagan Wylltson's best friend, Abby, dreams that horrifying creatures--goblins, shape-shifters, and beings of unearthly beauty but terrible cruelty--are hunting Teagan. Abby is always coming up with crazy stuff, though, so Teagan isn't worried. Her life isn't in danger. In fact, it's perfect. She's on track for a college scholarship. She has a great job. She's focused on school, work, and her future. No boys, no heartaches, no problems. This one really caught my attention. 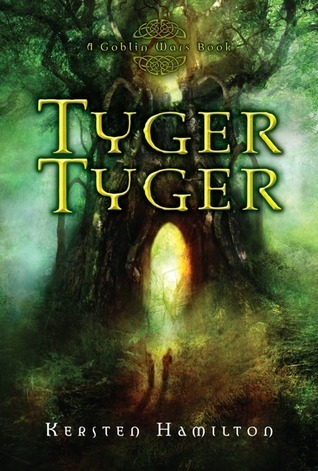 Kersten Hamilton infuses it with Irish mythology and creates a really tense and action-packed story. The book worked for me on so many levels. It has great mythology and brilliant characters - I think it was here that Hamilton excelled. I loved them all and really liked the family atmosphere she creates. Teagan was interesting as the main character – very easy to like and comes across as intelligent and kind – and of course I loved Finn Mac Cumhaill! At first he’s quite mysterious but as the book progresses more and more is revealed about him. I also adored Aiden and his relationship with his sister - Super sweet! And Abby was great fun – I definitely want more of her in the next book. The mythology feels fresh and different. I loved everything about it – and it really does have some very tense and scary moments. Cat-sidhes are now forever etched in my brain as rather terrifying! There are also some standout action scenes and moments when I found myself completely gripped by everything that was happening. It’s one of those books that I found hard to put down – I wanted to finish it in one sitting. All of this is grounded by the characters - their banter is fun and the basis for some really witty moments. There is a time jump about 100 pages in that makes the book feels as if it’s split into two parts. The first ‘half’ concentrates on building the world and characters - which may make the story hard to get into for some. However, I felt this paid off in the second half of the book – and I loved how all the pieces fitted together in the end. Everything we learn in that first half makes all that happens afterwards work – so it’s definitely worth it. And the second ‘half’ really hits the grown running – it really took me by surprise in its change of pace and sense of urgency. This was when I found myself really not wanting to put it down! My only complaint is I found the slight time jump jarring. Because of what happens in the scene before it I found myself still dealing with that when the characters had already moved on. It made it feel as if the characters were not as upset as they should be – but it does move the story to where it needs to be. I’m really looking forward to the next installment. I want to get back into the world Hamilton has created – and (unsurprisingly) I really want more time with Finn! I was really excited for this book and then my excitement stated to dim after heard a few so-so reviews. Your review jump started my excitement again and now I can't wait to read it. Thanks! It's also really good to know about the time jump mid-way through. I don't think any of the other reviews I read mentioned that. I'm so glad you liked Tyger Tyger, Sammee! I am really, really excited that it is out in 'the wild' this week and anyone can read it. This one is on my wish list. Thanks for the review!